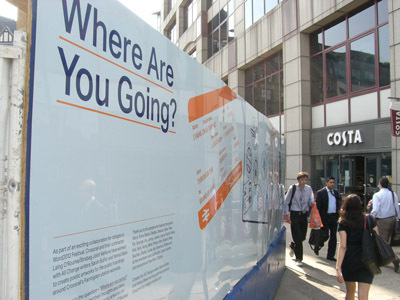 As part of All Change Arts‘ contribution to Islington’s fabulous Word Festival, I worked with poet Yemisi Blake and local residents and employees around Farringdon Station to create texts for a new hoarding in front of the Cross Rail site on Cowcross Street. We took the theme of journeys and travel, asking people the question Where Are You Going? and writing new work inspired by their answers. We launched the hoardings during the festival, reading travel-inspired poetry to passers-by on a beautiful bespoke soap box, designed, as are the hoardings, by Magpie Studio. 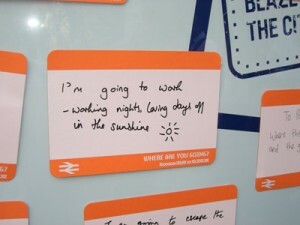 As part of the event we asked people to add their own texts to the hoardings as part of a temporary installation. You can read an article about the hoardings design in Design Week, or visit them in situ outside Farringdon Station (they should be there for the next year or so).